It's Friday night, and you forgot to prepare for your Dungeon Crawl Classics Road Crew event with the Norwin Game Knights, but you only have an hour before you need to pack your crap into your 2009 Chevy Traverse and hit the road. What do you do? I'll tell you exactly what you do. You grab your copy of DCC #76.5, Well of the Worm by +Harley Stroh, and you start reading. Remember that adventure? You bought it at Gary Con a few months ago, and it's been waiting to get played. It's been begging to get played. Don't let anything hold you back. Your kids may be screaming that they can't find their shoes. Your wife may be upset that you haven't taken care of the dog yet. You ignore all of that crap and focus on those words. It's only twelve pages that you need to read. You can do it! You have to do it... because lives may depend on it. Okay, in all seriousness, last night wasn't quite that dramatic, but it wasn't far off. Running games with the young players at Norwin Game Knights' Open Game Night is definitely a matter of life or death. Mostly death. Thankfully, it's so easy to create and print character sheets over at the Purple Sorcerer's site! I was short on time, and had forgotten to prepare an adventure before the game. Maybe "forgotten" is not the right word, how about "put off." I knew that I'd need to throw something together and had given some thought to just using my random dungeon dice and some Rory's Story Cubes in the same fashion as that legendary Centi-goats of Centaurus 7 (Featuring Snoop Dogg) adventure. But at the last minute I changed my mind and wanted to toss something together that was a bit more formal. We've done a lot of funnels in our club, so it was time for a 1st level adventure. But I needed something short... something like Well of the Worm. Well of the Worm is a +Harley Stroh adventure that first appeared way back in DCC #29, The Adventure Begins. DCC #76.5 is a conversion by Daniel J. Bishop that updates Harley's original work to the Dungeon Crawl Classics Roleplaying Game. 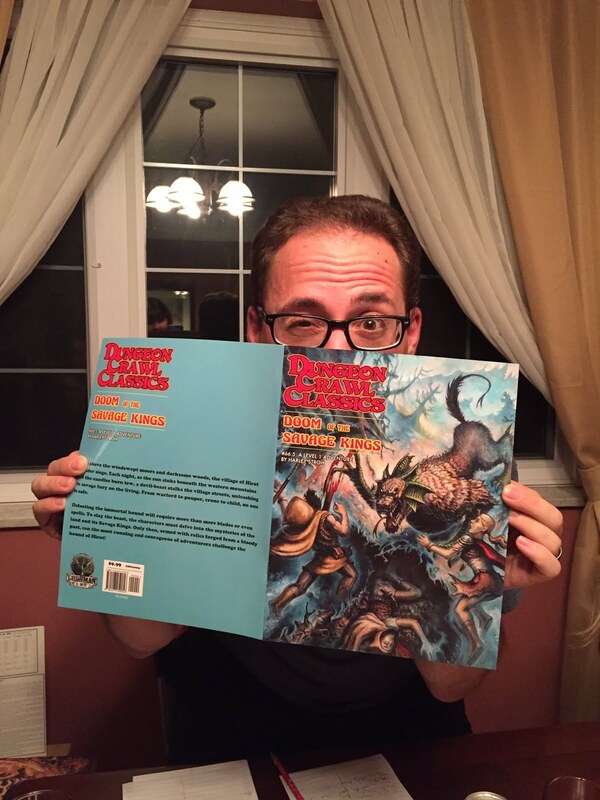 You see, kiddos... back in the old days, DCC adventures were created using the Dungeons & Dragons 3rd Edition (or 3.5 Edition) rules. This was before all the glorious Spellburn, Corruption, and Luck mechanics that we know and love now. I'm so glad that I picked this adventure to run last night! To start off, it's a really quick read. Sixteen total pages that include two handouts and a map. Only twelve that you actually need to read. Even though this adventure is digest-sized, the print size isn't shrunken and is very easy to read. I read through the adventure in less than twenty minutes, and that included some time to take notes before the game. The plot is fairly basic, and seems meant to get plopped down in just about any campaign. There's some wicked-bad, worm-like evil lurking at the bottom of a cursed well, and the PC's need to go dungeon-delving. Evil wizard, giant worms, worm-breeding pits, lots of good stuff for young players. This was a great adventure for our beginners too, as the first few areas, while linear in placement, require serious problem solving. As the adventure progresses, the map opens up, along with exploration options. Keep in mind, that Well of the Worm is relatively short in play-time, which can be perfect given the right circumstance. There are only twelve areas to explore, and some of these are just subsections of larger sections of the map. The adventure also offers a series of wormy random encounters. I opted to run the adventure without the random encounters, and we completed the game in about two-and-a-half hours. In truth I need another thirty minutes, and had to rush the end scene. Experienced players could've buzzed through in about two hours, and with the random encounters and maybe a few add-in areas I could've pushed to four. Sul Tang the Dwarf, played by Evan. Woobloo the Wizard, played by Ryan. Squip the Cleric, played by +Carina W.
Vlad the Thief, played by Adam. Angry Squirrel the Thief, played by Evan. For such a short game, we had some terrific character development, especially revolving around Ryan's character Woobloo. At the start of the game, I informed Ryan about taking on corruption to boost his spellcasting. He wanted no part in this process! But when he cast his first Flaming Hands, and was about to lose access to the spell I had a voice call out to the wizard. "Accept it! Accept the corruption!" Woobloo agreed, and the wizard gained a snake tongue and nose slits. Well this took us down an interesting road! Ryan kept rolling poorly on spells, so he kept going to the corruption well. When he randomly rolled a snake head for corruption, I decided that this would be an "all-snake" theme. He also lost his legs and gained a snake tail. And that voice? It was the patron Azi Dhaka! We had a great time role-playing that interaction as Ryan tried out Patron Bond and suffered the consequences afterwards. Too bad this game was a one-shot! I'd love to see more of that interaction. Perhaps we need to see Woobloo again in a future game. We should probably discuss how Big Bird got involved in this game. The party was looking for a way to clear a room of all worm larva, and Ryan came up with the idea of summoning a giant bird to eat all the worms. Great idea, and I love saying yes! His wizard had the Animal Summoning spell, and he tossed in some Spellburning to boost the power. The result? "Can it be Big Bird?" Ryan asked. "Sure," I responded with an evil smile. And so, the giant yellow bird appeared and devoured all of the worm larva. Ryan was enthralled at this point! Even though he'd only have Big Bird for two hours, he wrote down the monstrous minion's stats, and Evan included him in Woobloo's character portrait. But there was a price for all that worm eating. Several scenes later, while the party was defeating the evil wizard at the heart of the adventure, the team noticed that the flesh beneath Big Bird's feathers was starting to writhe. The worm larva was taking hold! As soon as the wizard died, a giant worm burst out of Big Bird's chest, tearing the bird apart. I asked the players if they had ever seen the movie Slither, but unfortunately none of them had. ... because that felt right. As the rest of the party fled, Woobloo heard a voice calling from behind him. It was Big Bird! All that was left of the great yellow avian was his fat, feathered head. And it was calling for help. Oh the anguish! But Azi Dhaka demanded that Woobloo destroy the head as proof of loyalty... which Woobloo did. One of my favorite moments during the game was when one of the new players seemed aghast that Carrie and I were talking about her character, Squip, worshiping Cthulhu. I informed the player (I think it was Evan... new Evan not LOMLOI Evan) that in our family game night campaign, my wife's character is a priest of Cthulhu as well, so "like mother like daughter." "Great family game night," the kid laughed sarcastically. "Hey... that's how we roll," I responded seriously. Judge's Note: You may notice a few monsters in this play report that were not in the original adventure Doom of the Savage Kings. This is because these creations were designed by my son Cooper prior to the adventure. Cooper's been a bit too intimidated to join in these big games with a table full of grownups. So to help bring Cooper closer to our game, I let him play as Co-GM last night, and he helped run his new creations: the Deatheadians. I'll have full stats for the three Deatheadians later in this post. From each of those notes, I'm reminded what happened during the session, and I can turn it all into a beautiful play report for you to read. But sometimes there is so much going on that is so crazy and fantastic that I just can't keep up. I can either run the game or I can keep track of what's going on. I find it's always best to focus on the game. If last night had a theme, it was "saying yes." We have a fairly new player (Ella), and I really wanted to showcase how much freedom can be discovered within a tabletop role-playing game. I also made sure to be more open to my wife's crazy and over the top role-playing style. For those of you who may have had Jen at your table (or will have her at your table in the future), she can get a little crazy. Her characters are often outlandish, mischievous, and they continuously break the fourth wall. So yes, playing with +Jennifer Walls is like playing with Deadpool. The PC's had just finished exploring a chamber with a dead end in Tomb of Ulfhoenar. There was a great door on the far wall that could not be opened, flanked by a pair of unlit braziers. We started off our evening with a battle with four terrible monstrosities... the dreaded Two-Headed Deaths! Scroll to the top of this blog post. See that picture of Cooper? See the monster he's holding? This was a pretty brisk fight, with the four single-hit die monsters not serving much of a challenge. That's okay, Cooper was hard at work making more death for later. After a little searching the party discovered a hidden passage that led west. The next several sequences played out very quickly, so I'll list them in the same fashion. The thieves, Walden and P. Specs, crawl into the secret passage. The rest of the party hears a scream as P. Specs quickly crawls back out, followed by Walden, followed by an angry Tomb Ghoul. Walden, on the verge of death after getting slashed to hell by the ghoul, ran behind his teammates and hid under his shield. The Wize Wizard McBride tries to heal Walden but fails and gained disapproval. More on that in a moment. The party nearly defeats the Tomb Ghoul before the Wize Wizard McBride steps forward and talks some sense into the undead. The Wize Wizard McBride names the Tomb Ghoul "Brock," and takes it on as a minion. I need to take a moment to talk about the Wize Wizard McBride's terrible spellcasting. This was the single worst evening for a Cleric that I've ever seen in my years of running Dungeon Crawl Classics. My wife's character gained at least four points of disapproval after having spent so much of last week trying to remove. She also rolled low enough to have to roll on the Disapproval table three times, losing two spells for the day and earning some serious distrust from her deity Cthulhu. For the rest of the night, the Wize Wizard McBride would go into full conversion mode on every NPC that he met, in a very unorthodox fashion: the Cthulhu T-Shirt reveal. When the Wize Wizard McBride wanted to convert someone, he'd rip open his tunic and show off a Cthulhu T-Shirt. I don't know how this came into play, and don't ever remember giving it out as equipment, but Jen said that "WWMcB" had it, so I guess he did. The Wize Wizard McBride asks Brock about the way to the Wolf-Spear, and the ghoul motions towards the braziers in the main room. Walden and Huey decide to go back down the secret passage and they enter what appears to be a treasure room with a central pillar. Hung on the pillar were a wolf-spear and a shield. Walden shoots at the wolf-spear with his crossbow to knock it down. He hits the pillar instead. The wolf-spear falls to the ground and shatters. Another fake! The entire room started to collapse as a great trap goes off! Sir Huey almost dies by falling debris, but escapes anyway. When the two return to the main room Quinn (played by new player Ella) lit the two braziers and a secret portal in the ceiling opened up. Sometimes new players know best. A Six-Headed Death Bomb drops out of the secret portal, and that's a pretty fierce fight. During the battle, Walden pick-pockets the "bomb" from the demon/human/skeleton/human monstrosity. Zzizzle helps. With the Six-Headed Death Bomb defeated, the party investigates the portal. The secret chamber is a throne room, with a skeletal king resting upon the throne. Although nervous to take the swag from the skeleton king, Walden grabs a spear, a horn, and a silver wolf pelt. As he leaves, he hears some creaking, but Walden doesn't look back. But the skeletal king must have found Walden worthy, because everyone else sees the undead lord give a "thumbs up." Now with the wolf-spear, the party ditches the tomb and heads back to Hirot. Along the way, a band of hunters approach the team. The leader says that they had been sent by the Jarl to take the spear from the party should they be successful in the Tomb. Then the Jarl showed up. The Jarl had been with the party the entire time, and demanded that the hunters back off and let them head back to Hirot. All of the hunters are okay with this except for one. That last guy thought that the Jarl wasn't actually the Jarl, but an imposter. Walden killed that guy for being a snitch. The rest of the hunters disband and head back into the woods to do all kinds of hunting stuff while the Jarl leads the party to Hirot. But it wasn't the Jarl. Right before what I expected would be a combat, my daughter Carrie (playing P. Specs the Thief) asked if she could impersonate the Jarl with her Disguise Self ability. I was okay with it, but said that she'd need a high roll. Carrie dumped a ton of Luck into the roll, and I figured that it made for a much more enjoyable encounter than just another fight. Once back in Hirot, the players all took turns buying and selling their stuff from the adventure. They bought armor, weapons, and gear while equipping themselves with the magical items discovered during the quest. Sir Huey took the Horn of Kings while Jefff would wield the Wolf-Spear. Quinn cast Find Familiar, and ended up with a fairly useful focal squirrel familiar that she named Kippy. Quinn could cast spells, like Flaming Hands, through Kippy, with added effect. I'm sure that's going to make for an awesome scene later! Sir Huey, who was really injured, got his bride-to-be, the witch Ymae, to heal him, although the potion caused a bit of corruption and turned his feet into cloven hooves. This moment triggered a lot of nostalgia for me. Here I was, at a table with three of my good friends, my wife, my daughters, and one of my daughter's friends, watching all of them invest some time customizing their characters with their hard-won treasure. The table was littered with popcorn, pencils, dice, and doodles. It was the most "D&D-like" moment that I've experienced in a long time. It felt like home. It's moments like these that make me love Dungeon Crawl Classics so much. An infusion of the old and nostalgic with the new and innovative. Moments that speak to the old-school gamers as well as those who have never touched a tabletop RPG. There are a lot of games out there that touch on these moments, and bring them to the table occasionally, but in DCC, this "nostalgic innovation" is fully embraced, both within the game and the community. Crap, I'm getting misty eyed just thinking about it. The party had left town for the moors, and before entering the swampy territory a terrible, ten-headed, part human, part demon, part skeleton, and part human monster appeared, tethered together wielding a bow and knife, with swords on their heads. Walden shrugged and blew it up with the bomb he picked off of the six-headed variant earlier. Then Jefff stabbed it in the heads. "Hey guy. So you're octopus'ish, and I like octopuses. Bros?" - The Wize Wizard McBride tries to talk a drippy tomb ghoul into being his minion. "This is what happens when you call me a prospector!" - P. Specs, masquerading as the Jarl, kills the one hunter who didn't believe that the prospector was the Jarl. "I'm changing my title to 'Hand of the Jarl.'"" - Walden, after seeing P. Specs take on the Jarl's persona. These three entries are courtesy of my son Cooper. Just before the game, Cooper (who was my Co-GM) offered to make some monsters to throw into the game. He made the first one just before the game, and the second two while we were playing, throwing them into battle just after their creation. I've tweaked them a little, but have tried to keep them exactly as Cooper intended. 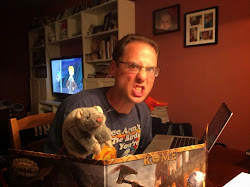 I really enjoyed playing DCC this way, and am considering running a few off-book games at Gen Con using this Father/Son Judging Method, with random, on-the-fly monster creation. There's not much ecology to the Deatheadians. Just know that they are all "part demon, part human, part skeleton, and part human." Cooper's words. So technically two parts human, one part skeleton, one part demon. Special: Plant Bomb. Six-Headed Death Bomb attempts to surround a medium sized target and plant a bomb on them. Reflex Save 15 to avoid, or suffer 4d6 damage explosion. The Six-Headed Death Bomb takes half of this damage. The Six-Headed Death Bomb bow is poisonous. If you pick it up, make a DC 10 Fortitude Save or Die. Then the bow disappears. Special: Surrounding Sword. The Ten-Headed Death Sword can surround a target and make a flurry of attacks with their sword heads. The target must make a DC 15 Reflex Save to avoid taking 10d6 damage. The Ten-Headed Death Sword bow is poisonous. If you pick it up, make a DC 10 Fortitude Save or Die. Then the bow disappears. On Monday night we celebrated our second session of this "Ninth World meets Weird West" mashup by doing absolutely nothing that had to do with the Weird West. If you remember, during our last session I expected my players to visit a nearby town for some old-timey, nineteenth century high jinks. Well that didn't happen. The party skipped an investigation of their new timestream, and just went right up the mountain in search of the Impossible Blade. What the heck? I want some Weird West action, and I want it now! Following the last encounter with the cypherids, the party had to distribute the fifteen cyphers that they recovered. The party changed the name of Ruun's new rifle-artifact. Suzanne, the lever-action, numenera-infused gun, would now be known as 5UZ4NNE. Perhaps I should make that canon, and rule that it's PL4T0's cousin? It was clearly a time for recovery rolls. Nero used an esotery to assemble "Babbage," a construct minion. PL4T0 used a cypher to duplicate Ruun so that the team would have an entity to use as "trap bait." It was during this rest that some members of the party investigated the nearby area. Although the party's initial reaction to this young land was that it seemed pristine and untouched, the area surrounding the pit was straight out of the Ninth World. The dirt was not soil but common drit found in the Steadfast and Beyond. The nearby tower structures were not built, but seemed to have grown out of the ground like nails from a finger. The area raised a lot of questions, so many of which could've led the party back down the mountain to the nearby town where maybe they could get some answers. But instead, the party decided to go down into the pit. The duplicate of Ruun was the first down a long, wooden spiral staircase. He made it nearly three-hundred feet until coming to an archway. Just before reaching the entrance to that level, one of the steps gave way, and duplicate run fell to his duplicate death. Figuring that the duplicate proved that the steps were relatively safe (save for the last one) the rest of the team traveled down to the first chamber. The room was full of bas-reliefs, each carved from a strange kind of stone. On the fair end of the wall, one of the bas-reliefs depicted an insectoid terror with two crystalline eyes. Between searching, scanning, and knowledge of the numenera, the team came to the conclusion that this entire was built out of a type of stone that had an effect on temporal energy. Time worked very differently here. Using his interface ability, PL4T0 was able to connect with a nearby piece of technology: the two button eyes in the insect bas-relief that controlled a door. PL4T0 and the door became close friends. To the semi-self-aware door, PL4T0 was a new deity. To PL4T0, the door was a door. ... and then the poor automaton got skewered by a great scorpion's stinger. Babbage could've survived if not for the flurry of detonations that were flung at the Auturi - a terrible, 3D printed mecha-organic fly/crab/scorpion thing. Oh, for those of you running The Devil's Spine for higher tier characters, I made the Auturi a bit hardier. Level 6 with 32 health and 2 attacks did the trick. The scorpion robot fly flew into combat, injected Keane with a bunch of poison that changed his arm's genetic code and turned it permanently purple, and wrecked the hell out of PL4T0's silicon body. This was a pretty tough fight in general, but the party pulled through. I don't even think Ruun was hit, and he proved that 5UZ4NNE was a pretty powerful piece of equipment. ... Will declined the GM Intrusion! This was a first for Will. I guess the idea of getting GMI'd while climbing down rope, with a potential of falling down an impossibly deep well, was too risky. Once everyone was down we moved on to the next portion of The Devil's Spine... or should I say "we DIDN'T move on." The next part of this adventure was supposed to be the alphabet puzzle found on page 50 of The Devil's Spine. This is the one where there are a series of five doors, and the party has to open and close them in a particular order, but the only hint is a series of letters found earlier in the adventure. In my version, it was the old fishing dude who handed this over. From that sequence of letters the party was supposed to figure out that they needed to open the first door, open the second door, close the first door, open the third door, etc. Personally, I thought it was a rather vague clue, and could see our group mulling this over repeatedly. I think I was lucky that I got them to skip out of the Auturi chamber above without spending a full hour looking for an exit from that chamber other than going back out the way then came. And it wasn't like there was an alternate way around the "alternating door opening puzzle", because the doors were all Level 10. Pretty much just one way to move the entire adventure along. So we skipped the entire scene. The next part of the adventure was a bit of a blur... a trap-filled, seemingly "Tomb of Horror" inspired blur. Arrow traps, pit traps, failing ceilings. It was pretty clear that this next entire sequence of the "Quest for the Impossible Blade" was going to require some pretty-typical dungeon crawling. Which we'll save for next week. "Sometimes you're like 'I don't want ice cream at all, I want sorbet.'" - Marc, before the game. Ruun - "I don't know where this Kansas is, but I don't want to go." Door - "I am a door." "Now you know what the door feels like!" - Will to Marc, who had just been interfaced with by the Auturi. Marc - "Dr. Nero... Medicine Woman." "Is this Tomb of Horrors?" - David was right on the money. "Could you form some crude stilts?" - Marc to David, trying to help his pal get out of a pit trap. Looking to broaden your horizons? Interested in pursuing strong academics amidst beautiful vistas? Excited to study advanced and challenging subjects such as Neural Architecture & Design, Interspecies Poetry, and Zero-G Dance Theory? Perhaps Leviathan Academy is right for you! Leviathan Academy is a JumpCorp sponsored community college located in the uncultural district of downtown Ralston. Graduates of our prestigious university are guaranteed great paying opportunities* after leaving Leviathan Academy. Ask any alumni and they'll tell you that their time spent at Leviathan Academy took them right to the perilous edge of excitement! So what are you waiting for? Download the application, send in your genetic material, and plan for an academic adventure like none other... at Leviathan Academy! *Post-graduate employment guarantee limited to JumpCorp opportunities. I've been talking and writing about this mash up for well over a year now. You take Savage Worlds East Texas University and you transport it across the galaxy into The Last Parsec. Reskin some of the paranormal to be more like super-science (a la Doctor Who), and toss in a bunch of laceraun (dinosaur) action, and you get Leviathan Academy. In my mind this should play out as Firefly meets Community meets Jurassic Park. I'm a fairly lazy GM, so I'm not here to show off a bunch of conversions, or additional setting rules. After setting up a one-shot that I'll be running in a few weeks, I took a look through all of my ETU and TLP stuff and realized that, just like pretty much all Savage Worlds mashups, this would be really easy to do on the fly. All you need to do is add some species options for starting player characters, and reskin the extra-curricular activities. Rather than taking on this work myself, I turned to the Official Savage Worlds Facebook Group and asked for suggestions so that we could create a list of Majors for Leviathan University. Those cooked up by the wonderful members of that group got extra credit! Wait, not enough? What am I missing? If you can think up more, send them my way and I'll be sure to add them to my list. Another interesting evening in the Walls household during our Friday Family Game Knights. Before kicking off last night's game, I had to set up our two new players (Ella and Tristan) with some zero-level characters via the Purple Sorcerer character generator. Typically players don't get much of a choice when creating these characters, but I let each of them choose their origin. Either they could play Vinlander (Viking) natives of Hirot village, or they could be from the "World of Tomorrow" like Frank's characters. Ella chose the World of Tomorrow, and Tristan the Vinlanders. Out background story for these six new characters was that Talu, Dwalk, and Carmac were scouting the nearby region surrounding Hirot when they came across Quinn, Lucca, and Blaze. The latter were associates of Zzizzle Fenderbender, and were looking to link up with their Dwarven friend. When they returned to Hirot, they were assigned to the village savior Kadabra's party as attendants. The party decided to spend some time in Hirot looking for clues on how to defeat the Hound. They knew that they could kill the creature with the magical Wolf Spear and then bind it using the enchanted hair of Ymae's hut. Sir Huey's first stop was at his betrothed's home. Sir Huey asked the Mad Witch Ymae for more information regarding the slaying of the Hound, but was pretty much told the same clues as before. They did discuss their upcoming honeymoon, however, including a staycation at the Sign of the Wolf-Spear. Kadabra figured that she could get Broegen to lend her the spear from his wall. Broegen seemed disinterested, but offered to just make her a new one. This came across as bizarre, so the Wize Wizard McBride cast Detect Magic only to find out that the item at the tavern was nothing more than a painted prop... a replica of the real thing. The Hound couldn't be slain by just weapons. The tomb of Ulfhoenar held an ancient chieftain, a savage king that was known as the wolf-slayer. The Jarl had a sorcerer who was in control of the Hound. The Hound could turn people into wolves by biting them. The party decided to try their luck at the Tomb of Ulfhoenar and headed north out of Hirot village. The tomb was located in a great mound, and the party had to slosh through a pool of water to get to the entrance: a giant stone slab. Moving the entrance was going to be difficult, so my wife Jennifer wanted to have her character's new god Cthulhu assist. I've never had a PC use Divine Aid before, so I asked Jen if she was really sure she wanted to perform this action, despite the ramifications. Jen said "yes", so the Wize Wizard McBride begged Cthulhu for aid, and a giant tentacle reached out of the ground and moved the stone slab. All of the water from around the area rushed into the tomb, flooding its unknown depths. Then I informed Jen that her character had suffered ten points of disapproval. Needless to say, Jen was not thrilled and she wanted to know how she could reduce the disapproval. I told her that she could reduce a point for every convert. Well, that got her two members of the party who were up for worshiping the elder god. But she needed more. Okay, that had to be a first! Although technically she wasn't getting new "converts", she was just getting "Likes." I'm not sure I would've counted this if I knew what exactly she was doing. The party traveled into the chamber, led by Blaze. But then the water, which the party new was magical from an earlier Detect Magic spell, formed into a great Serpent Spirit. Blaze got crushed by the water, and the party had to team up and defeat the elemental threat. A central chamber that served as a drain for the Serpent Spirit. A pair of stairwells leading down. The party followed neither. A collapsed chamber with a chest containing a magic, Lion Head Shield. A great room with a massive, mosaic covered stone door. In that last chamber, the dwarf Zzizzle Fenderbender thought something was off. The giant door seemed to be too heavy for any mortal to lift. If there was going to be an exit from this chamber, the team would need to find another way. PS: James Montgomery on Facebook suggested that a Twitter Monster should appear in next week's game... so this just happened. "So, are we Broegan's Heros?" - Jen's jokes are the WORST! "Staycation honeymoon?" - Andy tormenting Jeremy, as the latter's character, Sir Huey, has destined to marry the Mad Witch Ymae, and he was offering a stay at the Sign of the Wolf-Spear Inn in Hirot. "Have we met the 'year-old sorcerer' yet?" - Jen thought I was saying "year old" instead of "jarl." "This is TOTALLY Moana!" - Carrie commenting on the Serpent Spirit in the Tomb of the Ulfhoenar. "You're getting Octo-biceps." - The Wize Wizard McBride summoning the might of Cthulhu's blessing upon Walden. "Is it a one-handed shield?" - Andy was worried that his new magic shield was a variant that does not exist in any campaign.